One of the biggest areas for potential growth right now is Amazon Advertising. I could bore you with stats or I could provide you information that is far more compelling, namely that Amazon itself is ALL IN on advertising — increasingly on its own platform and off of it as well. And that’s a green light to you that you need to be involved in this because no company recognizes opportunity for growth like Amazon does. So you should be in too. Actually, you’ve probably been in for some time. By that I mean that you’re already advertising on Amazon using Sponsored Products. But that’s not enough anymore. As Amazon has upped its game, so must you up yours. Your first step is assessing your readiness for advertising growth and what you need to do in order to best position yourself for the right kind of expansion. First: What do I mean when I talk about scaling up and expanding Amazon Advertising? I mean taking your advertising to the next level and investing more time and more money and more expertise in your advertising efforts. All of those things require time, money, and knowledge. So before you invest in scaling up and spending more to make more and to build your brand and grow your revenue, you need to assess where you stand now and where you want to be in the future. We’ve created the following model to help you best understand your situation, challenges, and opportunities. Assessing yourself and your advertising efforts and ambitions (“working the square”) will tell you everything you need to know about your readiness for scaling and how best to do so. 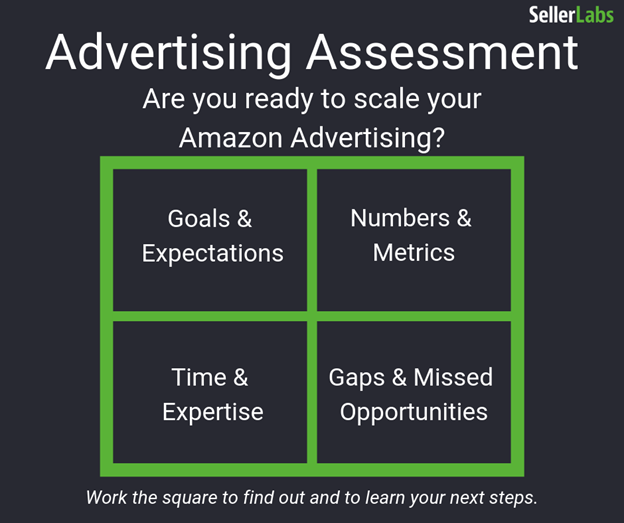 Download our free Amazon Advertising Assessment now, take your personal inventory, and get help and direction with next steps.